[7.1.5] Fire mage guide for Legion, by Rinoa - Altered Time - your #1 World of Warcraft Mage resource! Last update: June 11th 2017. Unfinished. Click on a part of the guide to be taken there through the power of wizardry. Fire is a spec which relies heavily upon critical strikes to fuel our hard hitting instant cast style of play. It requires quick thinking due to our ability to cast http://www.wowhead.com/spell=108853/inferno-blast" target="_blank in reaction to critical strikes while other spells are being cast simultaneously. This cast-while-casting aspect is unique to fire. - New artifact traits, as well as being able to add an additional point in certain existing ones up to a maximum of 4/4. At the most basic level, fire revolves around getting as much use as out of the http://wowhead.com/spell=195283/hot-streak mechanic as possible. http://wowhead.com/spell=195283/hot-streak makes our next http://wowhead.com/spell=11366/pyroblast or http://wowhead.com/spell=2120/flamestrike, two very hard hitting spells, instant cast and contribute twice as much http://wowhead.com/spell=12846/mastery-ignite as it would when hardcast. In order to activate http://wowhead.com/spell=195283/hot-streak we have to score two consecutive non-periodic (no DoTs!) critical strikes in a row. To aid in generating http://wowhead.com/spell=195283/hot-streak procs, the fire mage has two passive crit bonuses, and one active option. http://wowhead.com/spell=117216/critical-mass increases our critical strike chance by 15%. http://www.wowhead.com/spell=157642/enh ... rotechnics adds a stacking 10% critical strike chance to our http://www.wowhead.com/spell=133/fireball each time it fails to critically strike, acting as bad luck protection. The active spell, http://www.wowhead.com/spell=108853/inferno-blast, always crits and is castable while casting other spells, meaning we can use it mid- http://www.wowhead.com/spell=133/fireball cast or during a global cooldown when we have http://wowhead.com/spell=48107/heating-up (half a http://wowhead.com/spell=195283/hot-streak) in order to force a http://wowhead.com/spell=195283/hot-streak proc. http://www.wowhead.com/spell=133/fireball is our main filler spell, http://wowhead.com/spell=11366/pyroblast our single target nuke which we want to use when http://wowhead.com/spell=195283/hot-streak is active, http://wowhead.com/spell=2948/scorch our movement spell when all else fails, http://wowhead.com/spell=2120/flamestrike our AoE spell, http://www.wowhead.com/spell=194466/phoenixs-flames an instant nuke that always critically strikes and does splash damage, and http://wowhead.com/spell=190319/combustion is our big cooldown. http://wowhead.com/spell=205020/pyromaniac provides us with roughly a couple of extra Pyroblasts per minute. This talent is about as strong as http://wowhead.com/spell=205023/conflagration, but alters the playstyle slightly. As this is a talent that requires interaction, it is more difficult to use it to perfection, which in my eyes diminishes the value of it when it still isn't the de-facto best when used optimally. It does increase our mobility though as more time is spent casting instant http://wowhead.com/spell=11366/pyroblast than when this talent is not selected. Unfortunately this talent causes some munching of http://www.wowhead.com/spell=195283/hot-streak, this is unavoidable even when playing flawlessly. The more crit we have, the more this will happen. That, however, does not mean it's a bad talent. 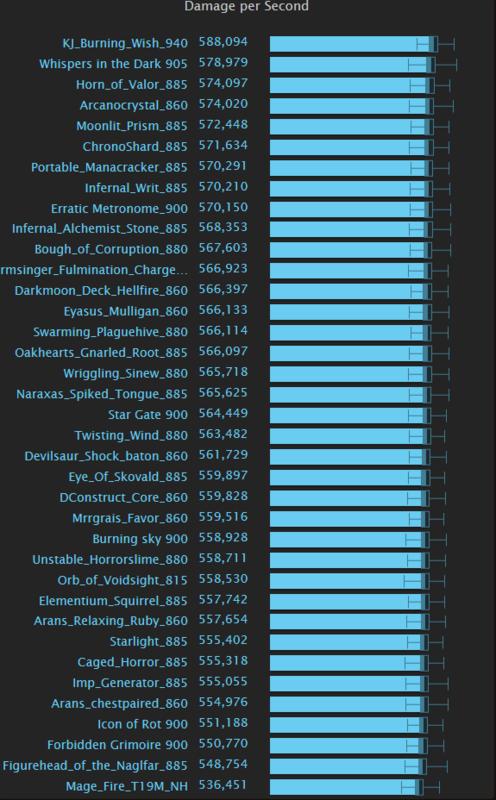 http://wowhead.com/spell=205023/conflagration is the top dog alongside http://wowhead.com/spell=205020/pyromaniac on this tier. The damage may look unimpressive, but the constant stream of it adds up to this talent being strong. As it excels at dealing damage over longer periods of time, http://wowhead.com/spell=205023/conflagration isn't the best for maximising burst windows but is strong when high damage over time is wanted. http://wowhead.com/spell=205026/firestarter is completely useless past 90% monster health, but provides a hefty boost to damage above that threshold. This means that it's very powerful in situations in which you require as high damage as possible on a target that is at 90% health or above, such as powering through the first phase of a boss. http://wowhead.com/spell=205020/pyromaniac for reactive single target throughput and more mobility through instant casts. http://wowhead.com/spell=205023/conflagration for a passive damage dealer, strong on sustained cleave and AoE. http://wowhead.com/spell=205026/firestarter can be good for open world solo questing and high health% burns. http://wowhead.com/spell=212653/shimmer is the highest skill option here. With proficient usage it's possible to practically always be casting. It functions with http://wowhead.com/spell=194318/cauterizing-blink, every time you http://wowhead.com/spell=212653/shimmer, it activates. If you http://wowhead.com/spell=212653/shimmer once more before the heal is finished, a new buff overwrites the old one and as such the heal goes back to its original duration, as if you had just cast your first one. You can http://wowhead.com/spell=212653/shimmer back-to-back for significant healing over time. It also lets us avoid mechanics without losing casting uptime as it's not on the global cooldown, making this the only talent on the tier that's a DPS increase in the conventional sense - through increasing DPS uptime rather than allowing us to deal with dangerous mechanics in more brute force ways such as the other two options. http://www.wowhead.com/spell=157981/blast-wave is in my opinion strictly inferior to http://wowhead.com/spell=212653/shimmer but can serve as a good slow if you require the stun removal part of http://www.wowhead.com/spell=1953/blink. http://www.wowhead.com/spell=235365/blazing-soul is nigh worthless since http://www.wowhead.com/spell=235313/blazing-barrier is broken almost instantly anyway, but potentially can have some niche uses if you need to mitigate low DoT damage and can stay close to your target. http://wowhead.com/spell=212653/shimmer for offense, movement and DPS. http://www.wowhead.com/spell=157981/blast-wave for a short range PBAoE slow and http://www.wowhead.com/spell=1953/blink stun removal. http://www.wowhead.com/spell=235365/blazing-soul if you are a special snowflake. http://wowhead.com/spell=55342/mirror-image is a typical fire and forget damage cooldown. They do good damage, though only attack single target at a time, last for 40 seconds and are great if you cannot find the time to stand still and DPS well yourself. While the images are active, your threat is reduced and as such they can be particularly useful for soloing as they will tank and distract monsters for a period of time. http://wowhead.com/spell=55342/mirror-image inherit your stats, though does not work with mastery. This has two important implications. One, it works with http://wowhead.com/spell=190319/combustion, meaning http://wowhead.com/spell=55342/mirror-image always crit while it's active. And two, because they do not inherit our mastery stat at all, it often is the case that at the start of the expansion pack they are quite strong, but as we gain more stats they fall of. This is because an increasing amount of stats are being ignored, while the other talents on this tier are able to utilize them all. At some point the lack of mastery outweighs the base power of http://wowhead.com/spell=55342/mirror-image. At the present time, they are strong enough on single target to rival or even surpass it's competitors. 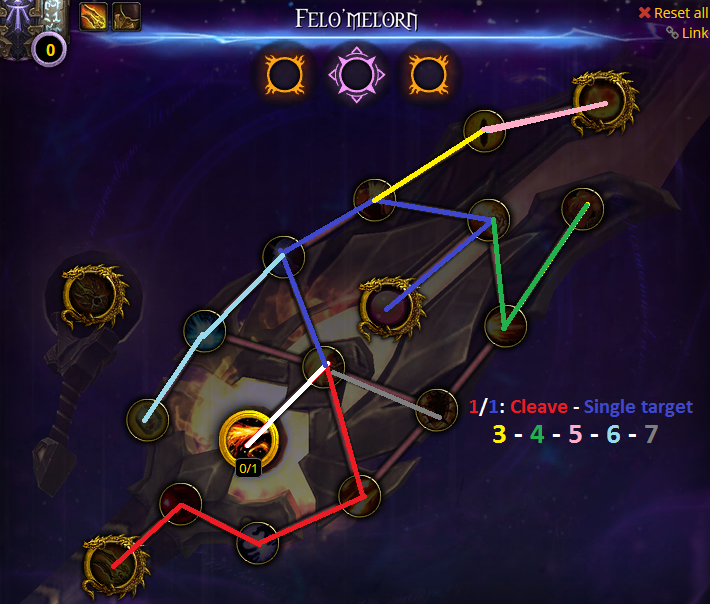 http://wowhead.com/spell=116011/rune-of-power can be very satisfying, and when used well this is the strongest damage increasing talent on the tier for cleave/AoE, and on par with http://wowhead.com/spell=55342/mirror-image for single target. It combos particularly well with other abilities that fit within the http://wowhead.com/spell=116011/rune-of-power window, such as http://wowhead.com/spell=190319/combustion as well as trinket procs and equivalents. http://wowhead.com/spell=1463/incanters-flow is simply a passive damage boost. Pick this if you want less things to keep track of, but expect worse results than with http://wowhead.com/spell=116011/rune-of-power used optimally. It also has the advantage of providing a damage boost in situations where there isn't a good opportunity to stand inside of http://wowhead.com/spell=116011/rune-of-power when burst damage is required, or when you want a high amount of sustained damage without the large spikes provided by the other two talents. http://wowhead.com/spell=55342/mirror-image for a fire and forget single target damage cooldown. http://wowhead.com/spell=116011/rune-of-power for play revolving around burst timings. http://wowhead.com/spell=1463/incanters-flow if you want a passive damage boost. http://www.wowhead.com/spell=235870/alexstraszas-fury pairs exceptionally well with http://www.wowhead.com/item=132863/darc ... ire-diadem for cleave and AoE. http://wowhead.com/spell=205029/flame-on is the strongest talent on this tier, providing a high amount of extra http://www.wowhead.com/spell=195283/hot-streak procs in a controlled manner, meaning it can be used to aid in the chaining of http://wowhead.com/spell=11366/pyroblast during http://wowhead.com/spell=190319/combustion. In any conventional scenario, pick this. http://wowhead.com/spell=205033/controlled-burn is similar to http://wowhead.com/spell=205020/pyromaniac in the sense that it additional random http://www.wowhead.com/spell=195283/hot-streak. Unfortunately for this talent, it is on the same row as http://wowhead.com/spell=205029/flame-on and http://www.wowhead.com/spell=235870/alexstraszas-fury and as such isn't worth picking. http://www.wowhead.com/spell=235870/alexstraszas-fury for snap AoE or cleave with http://www.wowhead.com/item=132863/darc ... ire-diadem. http://wowhead.com/spell=205029/flame-on for controlled http://wowhead.com/spell=195283/hot-streak generation and raw DPS. http://wowhead.com/spell=205033/controlled-burn for some additional random http://www.wowhead.com/spell=195283/hot-streak. http://wowhead.com/spell=113724/ring-of-frost can be situationally useful if there are many freezable adds that require a reliable way to crowd control them. This spell acts as an incapacitate, and as DRs as such. http://wowhead.com/spell=205036/ice-ward can prove useful for kiting, but that rarely applies in raids as any mob rooted by Frost Nova will turn around and melee anything in melee range. http://www.wowhead.com/spell=236058/frenetic-speed for more mobility and DPS uptime. http://wowhead.com/spell=113724/ring-of-frost if you want to be able to provide more CC. http://wowhead.com/spell=205036/ice-ward for more Frost Novas. http://wowhead.com/spell=44457/living-bomb now only lasts 4 seconds and automatically spreads itself to anything it hits on the first explosion. Following explosions will not spread it further. It is strong for both burst and sustained AoE when you are able to ensure a successful spread to multiple targets. It is a DPS loss to cast http://wowhead.com/spell=44457/living-bomb on a single target if it does not spread to anything, compared to not using it at all. http://wowhead.com/spell=157976/unstable-magic is the passive option, providing our http://www.wowhead.com/spell=133/fireball with a bit more damage. Indirectly this talent also increases the damage our other spells do as it never takes a global cooldown and as such allows us to spend more time casting other damaging spells. http://wowhead.com/spell=205037/flame-patch increases the damage of each http://wowhead.com/spell=2120/flamestrike and as such is good in situations where you are damaging stationary targets for a while. Keep in mind this is a ground effect that lingers, and as such targets need to remain in it in order to take damage. http://wowhead.com/spell=44457/living-bomb for cleave and AoE when you can ensure it spreads. http://wowhead.com/spell=157976/unstable-magic for a passive option for a lower amount of targets. http://wowhead.com/spell=205037/flame-patch unfortunately outshone by Living Bomb on mass AoE. Can be good on cleave. http://wowhead.com/spell=155148/kindling reduces the cooldown of http://wowhead.com/spell=190319/combustion by a significant amount. http://wowhead.com/spell=198929/cinderstorm is very powerful when you are able to hit a lot of cinders, even on single target. Hitting all of them is often difficult, particularly on smaller targets. The damage does not split and as such remains very powerful at any number of targets. Try making sure the targets hit are already affected by http://wowhead.com/spell=12846/mastery-ignite as that increases the damage by 30%. In the event that you hit mobs that are not affected by http://wowhead.com/spell=12846/mastery-ignite do note that because http://wowhead.com/spell=198929/cinderstorm sends out multiple cinders that hit at different times and WoW processes damage in batches, the first batch of cinder damage being calculated will trigger http://wowhead.com/spell=12846/mastery-ignite for the following batches to take advantage of. http://wowhead.com/spell=198929/cinderstorm also interacts with http://wowhead.com/spell=194329/pyretic-incantation from http://wowhead.com/item=128820, meaning it can add 5 stacks in a single cast. http://wowhead.com/spell=153561/meteor splits its impact damage between all targets hit, stripping it of its enormous hypothetical AoE potential. The burn on the ground left behind by the impact does not split, making this an okay talent for any number of targets. Keep in mind it does not impact instantly and as such it's best used on targets you know won't move for a while. http://wowhead.com/spell=155148/kindlin gives us more http://wowhead.com/spell=190319/combustion casts. http://wowhead.com/spell=198929/cinderstorm is strong on any number of targets, ensure they are already affected by http://wowhead.com/spell=12846/mastery-ignite. http://wowhead.com/spell=153561/meteor is best used on stationary targets, ok for single target burst. Our single target damage is split into two parts. Sustained damage outside of cooldowns, and what we do when http://wowhead.com/spell=190319/combustion is on the table. It is important to note that http://www.wowhead.com/spell=108853/inferno-blast is used while casting http://www.wowhead.com/spell=133/fireball. When you chain http://www.wowhead.com/spell=133/fireball and one critically strikes, do not cancel your cast. Simply keep casting another http://www.wowhead.com/spell=133/fireball, hit http://www.wowhead.com/spell=108853/inferno-blast while it's casting, and follow it up with a http://wowhead.com/spell=11366/pyroblast. - (with http://wowhead.com/spell=116011/rune-of-power talented) Do not sit on 2 charges. Float at 1 charge while using ones that aren't going to be paired with http://wowhead.com/spell=190319/combustion to take advantage of stat procs and http://wowhead.com/spell=205029/flame-on if talented. - (with http://wowhead.com/spell=153561/meteor talented) Cast http://wowhead.com/spell=153561/meteor on cooldown unless http://wowhead.com/spell=116011/rune-of-power is about to be cast, then you delay it a few seconds to take advantage of the +40% damage, or if it won't come off cooldown before http://wowhead.com/spell=190319/combustion. It's worth pairing them up. - (with http://wowhead.com/spell=44457/living-bomb talented) Cast http://wowhead.com/spell=44457/living-bomb if it will spread to something, it's okay to delay it a few seconds if it guarantees a spread to many adds. If no targets other than the main target are present, it is a DPS loss to cast compared to not using it at all. - (with http://wowhead.com/spell=198929/cinderstorm talented) Cast http://wowhead.com/spell=198929/cinderstorm on cooldown. - don't cap http://www.wowhead.com/spell=194466/phoenixs-flames charges unless http://wowhead.com/spell=190319/combustion is following shortly. 1. Cast http://www.wowhead.com/spell=133/fireball until you get http://wowhead.com/spell=48107/heating-up. 2. Cast http://www.wowhead.com/spell=108853/inferno-blast to turn it into http://wowhead.com/spell=195283/hot-streak. 3. Cast http://wowhead.com/spell=11366/pyroblast to consume http://wowhead.com/spell=195283/hot-streak. The filler rotation is to chain http://www.wowhead.com/spell=133/fireball until one critically strikes and provides us with http://wowhead.com/spell=48107/heating-up. Then, not stopping the chain-casting of http://www.wowhead.com/spell=133/fireball, use http://www.wowhead.com/spell=108853/inferno-blast to turn http://wowhead.com/spell=48107/heating-up into http://wowhead.com/spell=195283/hot-streak, and queue up a http://wowhead.com/spell=11366/pyroblast so that it fires off directly after the http://www.wowhead.com/spell=133/fireball we're in the process of casting. While doing this, keep using talented abilities such as http://wowhead.com/spell=44457/living-bomb, http://wowhead.com/spell=198929/cinderstorm and http://wowhead.com/spell=153561/meteor in the way described above in order to get maximum benefit out of them. Exploiting the full potential of http://wowhead.com/spell=190319/combustion requires some setup. The main goal during it is to cast as few filler spells as possible and as many hard hitting spells as possible. In order to facilitate this we should try to have at least 2 charges of http://www.wowhead.com/spell=108853/inferno-blast available plus http://wowhead.com/spell=195283/hot-streak when http://wowhead.com/spell=190319/combustion is used. Because of how http://wowhead.com/spell=198929/cinderstorm hits in batches, we can stand inside the hitbox of our target and have them all hit simultaneously. This means that any cinders which crit will grand us a stack of http://www.wowhead.com/spell=194331/pyretic-incantation, while any cinders that do not crit won't remove them. Any on-use trinkets, potions and other applicable buffs should be stacked on top of it as much as possible in order to increase its effect. - (if using http://wowhead.com/spell=116011/rune-of-power) cast http://wowhead.com/spell=116011/rune-of-power before you http://wowhead.com/spell=190319/combustion. - (if using http://wowhead.com/spell=153561/meteor) Cast http://wowhead.com/spell=153561/meteor. - don't cap http://www.wowhead.com/spell=194466/phoenixs-flames charges. 2. Cast http://www.wowhead.com/spell=108853/inferno-blast when you have http://wowhead.com/spell=48107/heating-up. Ideally it would look something like: http://wowhead.com/spell=11366/pyroblast -> http://www.wowhead.com/spell=108853/inferno-blast -> http://wowhead.com/spell=11366/pyroblast -> http://www.wowhead.com/spell=108853/inferno-blast -> http://wowhead.com/spell=11366/pyroblast -> http://www.wowhead.com/spell=108853/inferno-blast -> http://wowhead.com/spell=11366/pyroblast -> http://www.wowhead.com/spell=194466/phoenixs-flames -> http://wowhead.com/spell=11366/pyroblast -> http://www.wowhead.com/spell=194466/phoenixs-flames -> http://wowhead.com/spell=11366/pyroblast -> http://www.wowhead.com/spell=108853/inferno-blast. Strings of http://wowhead.com/spell=11366/pyroblast like these will produce very high amounts of damage. In the opener, pre-cast http://wowhead.com/spell=11366/pyroblast -> http://wowhead.com/spell=116011/rune-of-power -> http://wowhead.com/spell=190319/combustion -> http://www.wowhead.com/spell=194466/phoenixs-flames and then enter the sequence shown above, using http://www.wowhead.com/spell=108853/inferno-blast and http://www.wowhead.com/spell=194466/phoenixs-flames to generate procs to fuel http://wowhead.com/spell=11366/pyroblast. Note that if you are pre-potting with http://www.wowhead.com/item=127843/poti ... adly-grace, it's better to pre-cast http://www.wowhead.com/spell=133/fireball instead of http://wowhead.com/spell=11366/pyroblast in order to waste less potion uptime. Pre-cast http://wowhead.com/spell=11366/pyroblast -> http://wowhead.com/spell=198929/cinderstorm -> http://wowhead.com/spell=116011/rune-of-power -> use http://wowhead.com/spell=190319/combustion just before the cinders hit the boss. This will instantly give you 5 stacks. Then proceed as you otherwise would in the sequence above this. If the pre-cast http://wowhead.com/spell=11366/pyroblast does not crit, cast a http://www.wowhead.com/spell=108853/inferno-blast alongside the first http://www.wowhead.com/spell=194466/phoenixs-flames to ensure a http://www.wowhead.com/spell=195283/hot-streak. Because of http://wowhead.com/spell=12846/mastery-ignite, fire's playstyle doesn't change much until there are enough enemies to justify calling it an AoE scenario. At 3+ targets, start using http://www.wowhead.com/spell=31661/dragons-breath in your main rotation. Spend http://wowhead.com/spell=195283/hot-streak on http://wowhead.com/spell=2120/flamestrike when it'll hit 4+ targets. Keep in mind this is without http://wowhead.com/spell=205037/flame-patch talented. If http://wowhead.com/spell=205037/flame-patch is talented, spend http://wowhead.com/spell=195283/hot-streak on http://wowhead.com/spell=2120/flamestrike at 2 or more targets. Critical strike rating is the fuel of the fire spec. It is the stat the spec revolves around at its most basic, therefore it's unsurprising that it's also our best stat. Haste allows us to cast more spells, including http://www.wowhead.com/spell=133/fireball which in turn provides us with more http://wowhead.com/spell=11366/pyroblast. It also has the added benefit of reducing the cooldown on http://www.wowhead.com/spell=108853/inferno-blast. Mastery takes a portion of our damage and leaves a damage over time effect on the target based on the size of the intial hit of the http://wowhead.com/spell=12846/mastery-ignite generating spell along with the amount of mastery we have. Versatility is just a flat damage increase and damage reduction. A very general guideline to stat priorities might look like this: intellect > critical strike > mastery > haste => versatility. While mastery isn't that good on single target, it's our best stat on AoE. Therefore I think it's practical to include it as a strong stat when we gear. As long as a piece of gear has a lot of crit on it, it does not mattery very much which other secondary stat it has. Do note that certain talent choices, such as http://www.wowhead.com/spell=55342/mirror-image often increasing the value of haste rating, and can significantly affect stat priorities. Your best bet is to simulate your own character and see what is best for you. Also note that once Tier 20 4-piece is attained, itemlevel tends to matter most of all as critical strike loses some value. The fire artifact, http://www.wowhead.com/item=128820/felomelorn, will be our trusty companion through Legion. It provides us with a new ability - http://www.wowhead.com/spell=194466/phoenixs-flames which is a great boon to us, being instant and always critically striking. It can have a maximum of 3 charges at any given time. If we aim for having two artifact traits before raids open, we'll prioritise http://www.wowhead.com/spell=215773/phoenix-reborn and http://www.wowhead.com/spell=194331/pyretic-incantation first, the former being more powerful on cleave such as dungeons and questing, and the latter being stronger for sustained single target DPS. If you can only pick one before raids open, go with http://www.wowhead.com/spell=194331/pyretic-incantation. If you can get both, go for http://www.wowhead.com/spell=215773/phoenix-reborn first. Read it as you would a priority list. Single target/cleave are interchangable, you can pick whichever route you'd like first. Then, once you completed your first golden trait, just work your way down the list. Personally I am going for the cleave route first, but both the yellow and purple line are valid starts. As far as relics go, itemlevel comes first. However, there are certain traits that are more valuable than others. Any offensive trait, minus http://www.wowhead.com/spell=133/fireball damage, is generally about equal. The three big ones are increased http://wowhead.com/spell=11366/pyroblast damage, increased http://wowhead.com/spell=12846/mastery-ignite damage and reduced http://www.wowhead.com/spell=133/fireball cast time. If you can take one of these without compromising your weapon's itemlevel then do so. Because of the warforged/titanforged system, making an exhaustive trinket link is quite the undertaking. Therefore I recommend simming your character in SimulationCraft if you are unsure about a choice, as well as applying some brainpower and thinking about how any given trinket functions within your playstyle. Simulation courtesy of Frosted. For a more complete list, please check out Frosted's thread which is linked in the Fire Theorycrafting section. Keep in mind this is done in a single target simulation and as such is not representative of the trinket's power in cleave or AoE situations. We are very fortunate to have several players that dedicate a lot of time and effort to generating the mathematical knowledge that often drives our playstyles and talent choices. Part of this is reflected in some of the posts that are made on specific spec and class mechanics. If you are interested in learning more about how things work behind the scenes, feel free to click the following links and read on. - Frosted for supplying certain SimC pictures. I would like to thank Komma, Frosted, and others for the immense amount of work they pour into the Mage module of SimulationCraft. Without them, I would not be in a position to make this guide. I would also like to thank my guild, Pieces, for providing a place where I can play my class the way I love, and last but not least I'd like to thank all the Altered-Time community for being such a lovely bunch of mage-loving geeks. This is the first guide I have ever written. I hope you find it satisfactory, I intend on keeping it up-to-date and as such would love any input, comments and constructive criticism you can provide. Issues with a moderator or moderating action? Send me a PM. - Added Cinderstorm to Combustion section with Pyretic Incantation. - Added alternate opening sequence for players with Pyretic Incantation and Cinderstorm talented. - Added alternative opener when pre-potting with Potion of Deadly Grace, which makes Fireball superior to Pyroblast due to the shorter cast time. Thanks mate. You are a beast. Edit: Flame Patch is still bugged? Last edited by Windfury on Tue Jul 19, 2016 4:55 am, edited 1 time in total. Why does Scorch have a place in the Combustion* rotation, is the lower cast time worth the lesser damage for the crit, or does Scorch have an interaction that isn't listed on the tooltip? What do you mean exactly by " Generic Gear " ? Do you mean with Hellfire raid tier/trinkets or do you mean with non-raid tier/trinkets? The shorter cast time allows for quicker Hot Streak generation. While Scorch does very little damage on its own, it results in more time being spent on HS-Pyroblasting rather than Fireballing during Combustion. The difference is small, but there is a difference. Generic and not completely optimized (but still good) Mythic Hellfire Citadel gear, with trinkets that do not interact much with talents. Unblinking Gaze of Sethe and Desecrated Shadowmoon Insignia specifically. Last edited by Architech on Tue Jul 19, 2016 6:35 am, edited 2 times in total. Last edited by Searix on Tue Jul 19, 2016 6:36 am, edited 1 time in total. Last edited by Architech on Tue Jul 19, 2016 7:42 am, edited 2 times in total. Any chance you can give us the stats weight you used ? disclaimer: this is absolutely not true at 110, if you are 110 and from the future disregard this post. Last edited by Architech on Mon Aug 01, 2016 3:28 am, edited 2 times in total. My i just hope they fix flame patch, i want my flame strikes to do pyro damage, grumble grumble. In your Cinderstorm sims, how are you using Cinderstorm? As close to on cd as possible after using HU/Pyro procs? Is Incanter's Flow better for sustained cleave/AoE than RoP? What about Orb of Voidsight?